What is modern? When it comes to teapots, the sky seems to be the limit and there is no one agreed upon design standard. Time to check out a few. 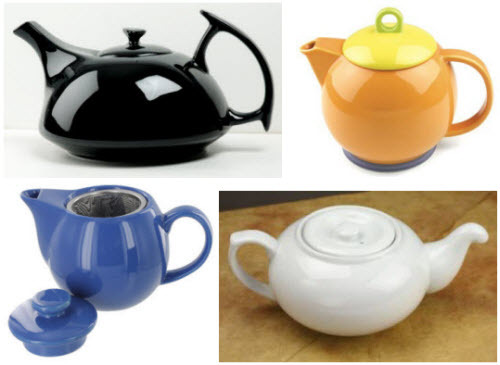 All of the above teapots say, “Hey, I really know how to steep tea, but I don’t have to be ugly.” And I agree! Metal and glass epitomize our modern age. New techniques in making both led to their widespread use throughout our environment, ranging from soaring skyscrapers to common items for your home. The teapot is no exception, whether it’s an almost “Robby the Robot” looking Henley 47-oz Stainless Steel Teapot, a simple and stylish Zen Style 42-oz Glass Teapot, or a sleek design (the Sorapot Modern Teapot) that combines both metal and glass (shown below left to right). Nostalgia is in full bloom in the hearts and minds of many ceramists and potters, inspiring them to create teapots that echo eras gone by, such as th Scatter Rose Fine Bone China 6-cup Victorian Teapot shown below at left, or introduce elements of another time and/or country as in the Japanese-styled teapot below at right. Odd teapot styles abound (as I spoke of in a previous article), but rather than repeat my listings in another article, I selected one that was a bit odd but attractively so. 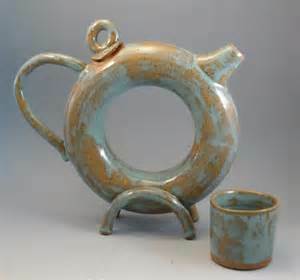 The goal often seems to push the envelope of acceptance on what the traditional shape of a teapot is. This teapot (called the “Donut Teapot”) shown here certainly does that. As for cuties, they abound, too, with everything from cupcakes to James Sadler Shakespeare’s Cottage Teapot (more info about Sadler) featured in their designs.